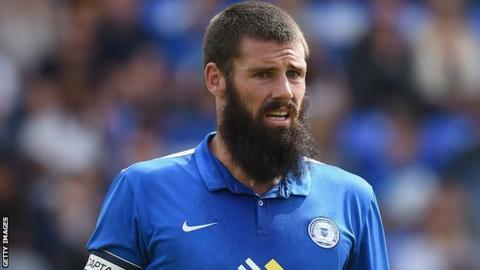 Michael Bostwick's late penalty helped 10-man Peterborough rescue a draw against second-placed Walsall. After a first half of few chances, Romaine Sawyers thundered in a 25-yard strike to put the Saddlers ahead. Posh midfielder Jermaine Anderson was sent off with five minutes left in the second half, having appeared to throw a drinks bottle into the crowd. But Bostwick denied Walsall the three points by firing in from the spot after he was fouled by keeper Neil Etheridge. "I'm actually standing here feeling deflated, it feels like a defeat, because how we haven't won that I don't know. "We took the lead with a great strike, we were in control of the game for long periods, but probably didn't work their goalkeeper as much as we should. (On facing Chelsea in the League Cup on Wednesday) "I'm looking forward to it. Wednesday should be a really good night and hopefully we can get the ground rocking and pull off a shock." Match ends, Peterborough United 1, Walsall 1. Second Half ends, Peterborough United 1, Walsall 1. Sam Mantom (Walsall) hits the bar with a right footed shot from outside the box. Attempt saved. Anthony Forde (Walsall) right footed shot from outside the box is saved in the bottom right corner. Attempt missed. Anthony Forde (Walsall) header from the centre of the box is too high. Corner, Walsall. Conceded by Ben Alnwick. Attempt saved. Romaine Sawyers (Walsall) right footed shot from outside the box is saved in the top left corner. Attempt saved. Milan Lalkovic (Walsall) right footed shot from the right side of the box is saved in the bottom left corner. Attempt missed. Rico Henry (Walsall) left footed shot from the left side of the box is too high. Goal! Peterborough United 1, Walsall 1. Michael Bostwick (Peterborough United) converts the penalty with a right footed shot to the high centre of the goal. Penalty Peterborough United. Michael Bostwick draws a foul in the penalty area. Penalty conceded by Neil Etheridge (Walsall) after a foul in the penalty area. Corner, Walsall. Conceded by Michael Bostwick. Jermaine Anderson (Peterborough United) is shown the red card for violent conduct. Substitution, Peterborough United. Michael Bostwick replaces Chris Forrester. Attempt saved. Conor Washington (Peterborough United) right footed shot from the centre of the box is saved in the top left corner. Jordan Cook (Walsall) wins a free kick on the left wing. Attempt saved. Romaine Sawyers (Walsall) left footed shot from the centre of the box is saved in the centre of the goal. Substitution, Walsall. Milan Lalkovic replaces Tom Bradshaw because of an injury. Delay in match Tom Bradshaw (Walsall) because of an injury. Corner, Peterborough United. Conceded by Jason Demetriou. Corner, Walsall. Conceded by Ricardo Santos. Attempt missed. Sam Mantom (Walsall) right footed shot from more than 35 yards misses to the left.